The easy trail is the road to the right. A look back down the road, from the middle. ...and downright pleasant in other spots. 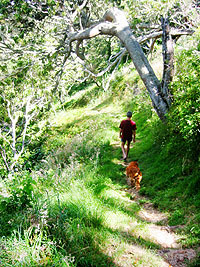 John and Coco in the Koa forest. 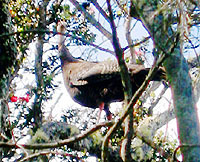 A wild Turkey watches cautiously. John looks for goats and pigs. 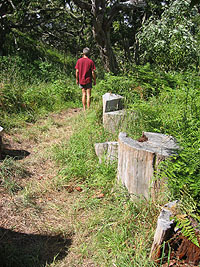 The stump-chairs are on the backside of the rough trail. 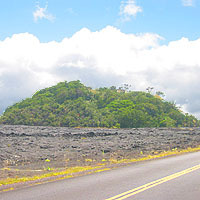 Not to be confused with the Pu'u Huluhulu hike in Hawai'i Volcanoes National Park, this cinder cone with the same name sits between Mauna Loa and Mauna Kea on Saddle Road. 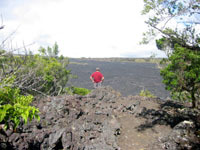 This delightful quick hike is a perfect stop in the middle of Saddle Road and also a good way to acclimate to high altitude before going up Mauna Kea or Mauna Loa. 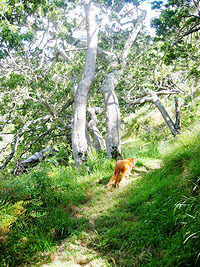 Multiple trails through native wooded forests take you up and around an ancient cinder cone, now part of the Hawai'i Natural Area Reserves Program. 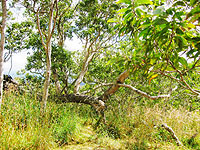 With breathtaking 360° views at the top, this short hike allows you to examine the native Hawaiian plant and bird life that live in this protected natural habitat. 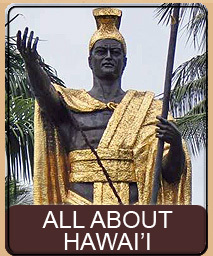 Pu'u Huluhulu can be reached in about the same amount of time regardless of whether you're on the Kona side or the Hilo side of the island. 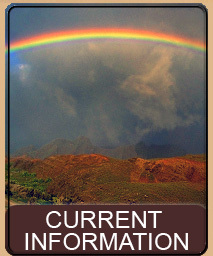 If you are on the Kona side or up in Waimea, take Highway 190 to the turn onto Saddle Road. 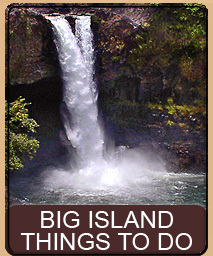 If you are on the Hilo side we recommend you follow the detailed instructions in our Scenic Drive To The Summit Of Mauna Kea, and read it up to the stop at Pu'u Huluhulu. 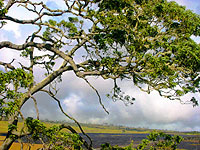 If you wish, you can incorporate the entire Scenic Drive into your trip as the Scenic Drive includes the Pu'u Huluhulu hike described below. 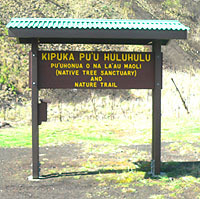 Regardless of which direction you came from, Pu'u Huluhulu is at the 28 mile marker on Saddle Road. This is a fairly easy hike and we describe two trails, one easier than the other. Since this is fairly short you don't need to bring much of anything other than your camera and perhaps some water. If you decide to take the more rugged trail you may wish to wear boots, especially if you are unfamiliar with walking on loose lava rocks. 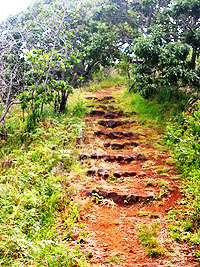 Since this is a good hike for acclimating before summit of Mauna Kea, this hike is fine in anything other than rain. We do not recommend the hike when it is wet because much of the hike is in Koa forest whose leaves are extremely slippery, especially when wet. 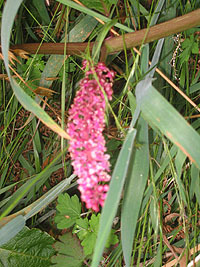 This is a protected wildlife area. A fence with three gates encloses the entire cone. The fence is to keep wild pigs and goats from damaging the native plant and bird life within the reserve. Please close all gates behind you and take care to avoid damage to the ecosystem in this fragile environment. This is a well-maintained trail system and environment. We have noticed the trails changing from time to time as volunteers modify the routes. Thus, keep in mind that the trails described here may be slightly different depending on any recent maintenance that has been done. 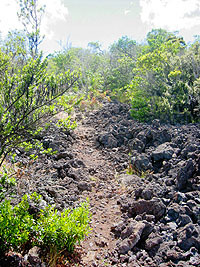 Depending on which trail you take, some of them have rough lava rocks sections. Take extra time and care when walking over these, as it is easy to lose your balance. 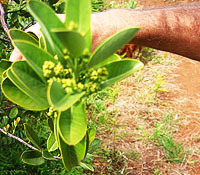 Much of Pu'u Huluhulu has a well-developed Koa forest. Koa leaves tend to be very slippery, even if not wet. Take special care on steeper sections of the trail. Though we are unsure whether or not this is still the case, our research has turned up indications that this might be part of the Unit E Game Management Area with seasonal bird hunting allowed. 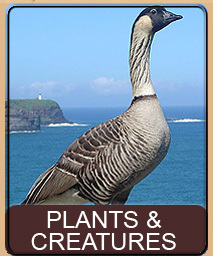 We personally find that hard to believe given the fact that there are so many protected and endangered birds in this area. 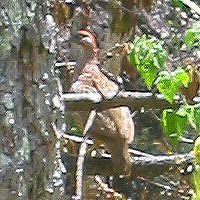 However, there are also wild turkey and pheasants so there may be some truth to the information. In any case, it might pay to not look like a turkey or make any turkey-like sounds during bird hunting season. Many of the rental companies make you sign paperwork that says you won't take the car on Saddle Road. The reasons for this range from the road being narrow and curvy in parts to no services along the road. The rental car company doesn't want to have to come out to give you gas. However, we see plenty of rental cars on Saddle Road all the time and the rental companies do not actually monitor where the cars go. However, if you would feel better about it, Harpers Rental, at (808) 969-1478, not only allows their vehicles to go on Saddle Road, they also rent a large assortment of 4-wheel drive vehicles. The Kona side of Saddle Road can be curvy, hilly and in some spots, very narrow. Take care driving and be aware for any possible fog that will obscure your vision. Note that part of the drive on this side currently passes through a military base on an extremely bad and narrow (though paved) road (this will be changing in the near future). The Hilo side of Saddle Road is, in spots, very curvy. When going up be sure to watch out for out-of-control vehicles that are coming down. When descending heed ALL speed limits. You will notice that on every extreme curve there will be a fresh set of skid marks, tire tracks in the grass and a bashed tree. Don't be one of those! 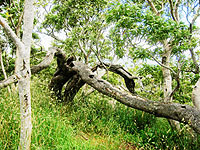 Pu'u Huluhulu, on Saddle Road, is part of the Na Ala Hele Hawai'i Trail and Access System and was originally constructed by the Youth Conservation Corps and is currently maintained by the Hawai'i Natural Area Reserves Program. This hike up this 200-foot cinder cone takes you from 6,560 feet to roughly 6,720. This pristine and protected 38-acre cinder cone represents a good idea of what the surrounding, now barren landscape, used to look like. 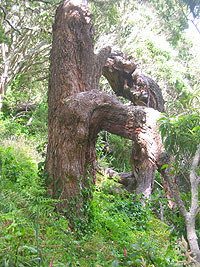 Primarily a Koa forest, the surrounding area called Humuula was largely deforested by a combination of livestock grazing and the 1843 and 1935 lava flows. 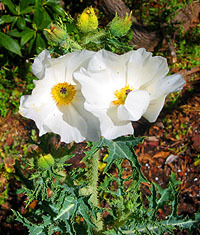 In the 1970's the Division of Forestry and Wildlife fenced the cinder cone to keep out the destructive wild pigs and goats, allowing native plants and birds to thrive on the protected cinder cone. 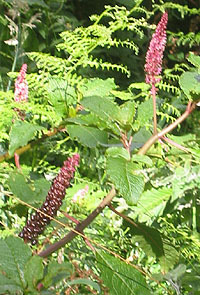 Among some of the rare forest birds you can see are the Ā'akepa and the Ā'akiapolaĀ'au. You can also find, Kalij Pheasants, Wild Turkey, and Pueo. 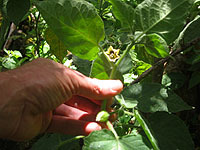 You can also find many different native plants, though there are also some invasive species such as German Ivy that have taken foothold. 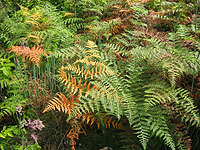 However the Natural Area Reserves Program keeps constant maintenance of the trails, native species and invasive species. 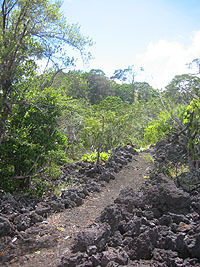 There are three trail entrances into Pu'u Huluhulu. 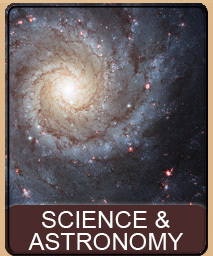 We recommend only two of the three. Of the two that we suggest, one is steeper and more rugged - but also takes you through much more of the diverse native life, while the other is simple and easy. Both take you to the top. We will describe both trails, starting with the easy trail and then followed by the more rugged trail. At the 28 mile marker on Saddle Road is a junction. 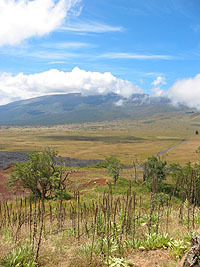 On the Mauna Loa side of the road is Pu'u Huluhulu, our goal for this hike. 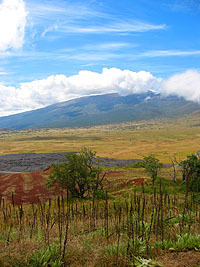 On the Mauna Kea side of the road is the junction road to the Summit of Mauna Kea. Just opposite the paved road to the summit is a dirt road the goes up to a fence at the base of Pu'u Huluhulu. You will also see a couple of structures outside and inside the fencep; pull into this dirt road and park. The structure outside the fence is a Hunting Station and is used by local hunters to record their hunts. 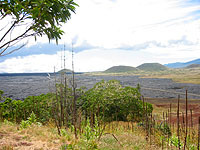 You will see a human sized gate and a car sized gate, go through the human sized gate and be sure to close it behind you as the entire kipuka is surrounded by a fence to keep out the destructive wild pigs and goats. The buildings inside include a toilet facility and small shelter. Behind the toilet is a steep trail up the side. This is the third trail we mentioned and we do not recommend it because it is steep and consists of fine ash that is both slippery and dirty. Avoiding the steep trail, simply follow the road that goes through the car gate and around the right side of the cone. At one time this cone was mined for material and this road was used to get to the dig. Now the road serves as a service road to the top for maintenance of the ecosystem. It is this easy road to the top we are going to stroll. While you are walking around to the backside, keep a lookout for wild pigs and goats outside the fence. Often you might see one or two bounding goats as they spring from hill to hill. 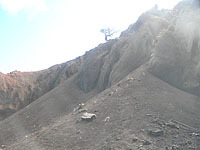 Towards the backside you will encounter the spot where material was removed from the cinder cone. While unfortunate that such a beautiful natural cinder cone was defaced in this manner, the dug out rock does offer an excellent view of the soil compositions and ash layers. Close examination will show both unusual and extremely fragile shapes, as the soft ash is constantly eroded away from the firmer rock fragments by the rain. Continue up the backside of the Pu'u and note the lush Koa forest you are now entering. 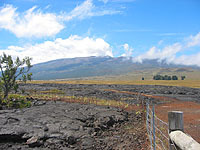 You will have occasional glimpses of Mauna Loa behind you, as the road becomes a bit steeper. 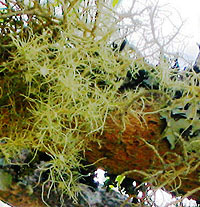 The Koa along this road, especially as you near the top, also exhibits an unusual lichen that is a pale, light green. Close examination of the lichen shows it to be quite beautiful with small pale flowers. After a bit the trees thin out and you come to a flatter area with a great view of Mauna Kea. The top of the cone is to your right and there are a number of small trails to the top where you can enjoy a near 360° view. A number of trails wind throughout the backside of the Pu'u, and back to the top again. If you intend to try any of these, you will find the entrance near the top of the cone. Facing Mauna Loa at the top, there is a small trail to your right that is actually between you and the road you came up on. 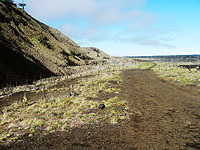 Taking this trail you will wind around the upper part of Pu'u Huluhulu and back over to the Mauna Kea side, where you can again go back to the road and back to your car. 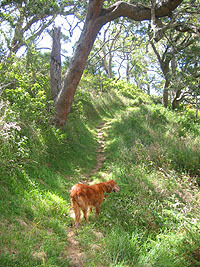 Otherwise, if you do not intend to take any of the side trails simply return the way you came, back down the road. If you prefer to take the more rugged trail (which adds a bit of time, but is quite beautiful and shows much more of the Pu'u) you will be parking in a different location than for the last trail. If you are coming from Hilo, as you approach Pu'u Huluhulu, but just before you get to it, there will be a rough red rock paved road to your left. 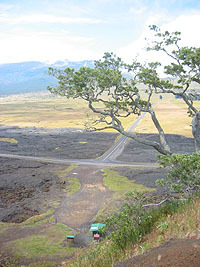 This is the road to the summit of Mauna Loa and you will note that it goes right next to Pu'u Huluhulu. 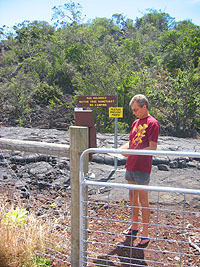 Pull into this road and take it to the gate in the fence around the Pu'u and park. If you are coming from Kona, go past the 28-mile marker and the road to the summit of Mauna Kea, and just past Pu'u Huluhulu you will see the red road we described above. Make a right and park by the gate. Go through the gate and close it behind you. Directly in front of you will be a steep rocky trail. This is the trail we will be taking. 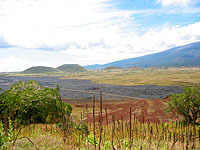 However, note that there are actually a number of other side trails that can be accessed by walking around the backside of the Pu'u - and even trails that split off of the trail we are describing. All are fun. The first part of this trail is basically just a scramble up the side of the cone, about 75 feet. 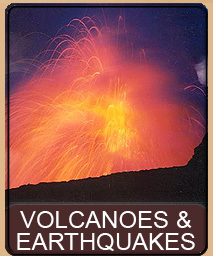 This is fairly easy but take care to avoid getting scratched on the lava. If you come to any side trails simply stay on the main trail, which always goes up and to the right (there are no side trails off the right side of the main trail, only off the left side). After the steep climb up you come to a more flat area. The trail is small loose lava rocks. This is a pretty area and you are likely to see, or hear, many birds around you. 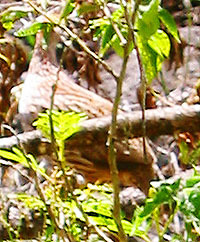 Look for some of the larger birds as they are probably just off the trail, but hard to see as they blend into the native plant life. 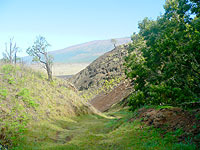 The trail descends a bit into the crater itself before again steeply climbing a grassy ridge. As you come near the top of the ridge you will see some amazingly huge Koa trees below you - some of the largest on the island. Near the top of the ridge you again meet a trail on the left... ignore it at this time and continue to the lip of the Pu'u where there is a wooden bench and a spectacular view of Mauna Kea. This is a nice spot to take a breather and a few pictures. You will also note that this is where the 3rd trail, which we do not recommend, comes out. 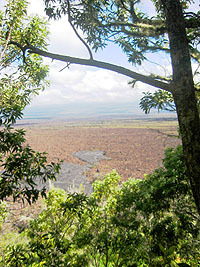 It is the dusty path that is in front of you that goes steeply down the front side of the Pu'u. Once you have rested, behind the bench is a staircase trail going up towards the top of the cone. Take this up to a flat area with more good views and photographic opportunities. Here you will also find the final trail that takes you up to the very top, with 360° views and a nice shady area to sit and enjoy a picnic or a steal a kiss. When you are ready to leave, we recommend an alternative trail down. 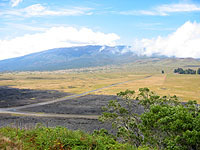 At the top, facing Mauna Loa, on your right will be a narrow trail that winds directly behind the top. This is a nice shady stroll (though be careful as the Koa leaves are slippery on some of the steeper parts) that takes you through the mature Koa forest all the way around the upper backside. As you wind your way back you will pass a tree that has been cut down and the stumps made into nice rugged chairs, a perfect spot for a short break. Continuing on, you go down a bit and then once again climb up a ridgeline, and finally come out back at the bench (that was the left we had you skip at the bench). At this point take the trail you came up, back down to your car. This page is named 'Hikes.hulu'. Can't Find It?